Washington DC – Gary Gensler, chairman of the Commodity Futures Trading Commission, said that after implementing the bulk of its derivatives market reforms, the regulator is now focused on compliance and enforcement, international harmonisation, and final rule-makings. LiquidPath® combines the Perseus award winning connectivity solutions with the Perseus global market-to-market ultra low-latency network. LiquidPath is a fast and cost effective solution for the deployment of the necessary equipment needed to be staged in foreign markets so that customers do not have to manage the complexities of having “feet on the street” in new emerging markets. Through efficient and high-performance trading infrastructure ideal for staging Market Data, Order Management (OMS) as well as Algorithmic and High-Frequency-Trading equipment, customers can benefit from state 0f the art equipment ready to be turned on as a service. Due to complex and static environments Perseus can offer proximity services for Direct Market Access (DMA) platforms, helping customers getting trading with exchanges or counter parties fast, saving time and money. Customers can enjoy having balanced IT investments with LiquidPath® making it easier to plan and allocate IT expenditures for trading emerging or foreign markets. “Liquidity Infrastructure” for local and global buy-side, sell-side and service vendors looking to access the Brazilian Securities marketplace. LiquidPath combines the Perseus award winning fastest connectivity solution with the Perseus Global Market-to-Market ultra low-latency network . LiquidPath is a fast and cost effective solution for the deployment of trading infrastructure into foreign markets so that your firm does not have to manage the complexities of local “feet on the street” in new markets you may want to trade. Efficient and high-performance trading infrastructure ideal for staging Market Data, Order Management (OMS) as well as Algorithmic and High-Frequency-Trading equipment. Complex and static environment optimal in colocation and proximity services for Direct Market Access (DMA) platforms. Well balanced IT investments – support for planning of IT expenditures. Perseus Telecom Brazil helps customers meet their requirements for low-latency market access and cost efficient IT products and services saving both time and money. network solution at the right price. Whether connecting trading desks to exchanges, establishing global wide area networks, or connecting from Europe and North America to emerging markets in Latin America, Asia and Africa; our customers have the competitive advantage that comes with innovation and experience in finance, banking, technology, law, e-commerce, multi-site enterprise, pharmaceutical, media and telecom sectors. CFN Services, a leading provider of managed IT services to the financial services industry, announced the debut of TradingHUB, the company’s highly secure cloud connecting liquidity venues worldwide with one single connection. As a vital source of connectivity for leading, security-conscious financial services players, TradingHUB safely connects buy-side and sell-side firms to global liquidity, while providing access to the advanced trading, analytics and data services available on CFN’s Alpha Platform. A single connection to any of the 50 global TradingHUBs deployed across the Alpha Platform enables clients to simply and affordably connect to key liquidity venues and trading partners across asset classes eliminating the need for expensive and complex market access networks, colocation and hardware. In markets with Alpha Platform Direct Connect (APDC), clients utilizing TradingHUB can leverage APDC’s low-latency direct market access and raw, full depth of book feeds from leading global exchanges. TradingHUB reinforces CFN’s reputation as an innovator in the evolving, financial markets for high performance automated trading solutions. “We’re excited to introduce TradingHUB, providing clients a more secure, agile and affordable means of accessing to today’s financial markets. Through a single connection, TradingHUB opens the door to hundreds of financial markets, leading intermediaries and tier-one trading partners around the globe,” said Paul Edelmann, Senior Vice President, Professional Services, CFN Services. On-Demand, the first, globally-distributed, high performance public cloud for the global financial markets; enabled market access over the fastest point-to-point wireless technology; and launched Alpha Platform Direct Connect, the company’s direct market access and market data platform. “In addition to exchange colocation facilities, we are pleased to announce the expansion into Telx’s two facilities on their Clifton, N.J. data center campus, which offers a unique set of differentiated features for the capital markets. Effective today, with a single TradingHUB connection, clients can connect from any venue, to any venue quickly and reliably on the Alpha Platform,” added Edelmann. Rapid Addition, a leading provider of trading technology to buy- and sell-side financial institutions, has joined forces with Azul Systems, the award-winning supplier of high-performance and elastic Java Virtual Machines (JVMs). Latin American trading services provider CMA has announced a new delivery method for direct BM&F and BOVESPA market data and trading connectivity for International firms. CMA has been providing BM&F and BOVESPA market data for over thirty five years to the trading community of Brazil.It now has leading exchange trading software services in Spain, Mexico, Colombia, Peru, Argentina and Chile with 20,000 subscribers worldwide. Today, CMA’s platforms such as CMA Series 4 have been rolled out on an impressive network called “CMA Redes Digitais.” The Redes Digitais infrastructure is installed and directly connected within the exchange’s datacenter for the lowest possible latency. Today’s announcement by CMA represents the launch and deployment of a directly connected infrastructure at the BM&F BOVESPA in São Paulo, Brazil with the CMA datacenter in New York. Companies can now co-locate their routers and servers with CMA at the BM&F BOVESPA datacenter or chose to receive the raw market data over CMA’s multi-gig private lines which terminate at CMA’s datacenter in New York City. The offering was developed to help firms trading with counter parties in São Paulo or for going directly to the exchange’s trading systems in a Direct Market Access (DMA) fashion. Many firms need to bring market data back to the USA and in return send trades messages to the exchange in Brazil. In both cases planning, paperwork and relationships are needed in order to complete the set-up. CMA is a certified exchange vendor able to help participants with the required documentation needed by the exchange to receive market data and to send trade messages. CMA also provides the relationships and connectivity to Brazilian brokers who can handle orders for foreign firms. 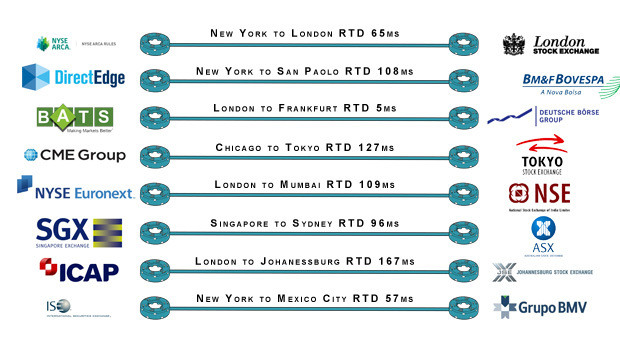 CMA is utilizing the fastest Trans Atlantic cable systems available, giving connectivity managers the security they require for proper networking, the lowest possible latency for competitiveness, multi-market/asset availability and an array of choices in being able to do so. Connectivity managers can now expand their market reach with CMA as they look to join both the BM&F BOVESPA Equities and Futures markets at roughly 50% lower IT and communications costs than other offerings which generally only provide one feed stream and one market at a time. CMA’s solution is the most cost effective, fastest and easiest way to implement an electronic trading solution for Brazilian securities. Denver, CO, April 29, 2013 – CQG, Inc. will offer low-latency, hosted connectivity to NASDAQ OMX NLX (“NLX”). AlgoSpan, the specialist market infrastructure provider, is pleased to announce that Bank of America Merrill Lynch has gone live with AlgoSpan’s European low latency exchange market access platform, “AlgoNet’. From January 2013, Bank of America Merrill Lynch clients have been able to access AlgoSpan’s low latency pan-European inter-exchange network, including co-location at all major venues. Russian institutional broker Otkritie Capital is working with SunGard to deliver a direct market access (DMA) service that supports automatic real-time currency conversion from the Russian Ruble to the US Dollar, as well as client access to Russian trading venues using Otkritie’s suite of algorithmic trading strategies. The companies completed work on the service in March and it is now live and automatically available in all SunGard Valdi and FIX-enabled trading applications and to the SunGard Global Network community. SunGard reports that some of its clients are using the service and more are expected to join, trading through Otkritie using both manual and automated services. Otkritie is the first broker in Russia to offer its algos to both its own and SunGard’s clients as part of an automated trading service run over the SunGard network. But it is not expected to be the last as trading interest in Russia gains traction and the Russian market seeks to mimic western European markets. The currency element of the DMA service automatically converts Russian ruble denominated transactions executed on Moscow Exchange’s Micex order books into U.S. Dollar execution fills, allowing clients to be currency neutral and avoid the complexities of ruble clearing and holding. SunGard has worked in Russia’s capital markets for over a decade, providing connectivity for firms outside the country to trade on Russian markets and supporting Russian firms trading on Russian and international markets. For many years, Russian stock has been traded on Moscow exchanges and the London Stock Exchange’s international order book, but over the past couple of years, political desire to create a financial centre of excellence in Moscow has led to the merger of the RTS exchange into Micex, efforts to pull trade back from London to Moscow and the elimination of some of the complexities around trading in Russia, including T+0 settlement. The result is a more westernised trading environment aimed at attracting more international investors and including T+2 settlement and support for initiatives such as Otkritie’s new DMA service. Orc, a leading provider of technology and services for the global financial industry, today announced that PhillipCapital, India (PhillipCapital) has deployed Orc Access to meet the growing market demand for low-latency connectivity in India. @bitreserve: @aimee_beck Thank you so much for the follow! And hey, we just added the Canadian dollar to our currencies! New York City Magazine! Marketing, Social Media, Business - Connecting The Dots!